Blending the graceful elegance of the Saddlebred with the size, bone and mind of the Friesian and/or Draft. The purpose of blending of the Saddlebred with the draft or Friesian is to produce offspring that are the perfect blend, having the best of both "worlds", resulting in the heavier boned, "old fashioned" or Baroque saddlebred type; Such is the magnificent Georgian Grande. The bloodlines must be a blend of the saddlebred with Friesian, Clydesdale, Shire, Percheron, Belgian, Brabant, American Cream Draft, Registered Drum Horses and Gypsy Vanners ("aka" Gypsy horses") are acceptable provided they are registered within their own breed and have proof of pedigree. The percentage of saddlebred can be up to 75% but never less than 25%. Many times people ask IGGHR if they can register a horse that is part Arab, TB, Morgan,etc. The answer to that question is no; The horse must be a blend of one or more of the above mentioned Friesian or draft breeds and saddlebred. No other combination will be accepted. The "light" horse in the pedigree must be Saddlebred and Saddlebred only. The Georgian Grande horse has the elegance and noble bearing of the saddlebred perfectly blended with the size, good bone and calm disposition of the Friesian or draft. It carries itself with an attitude that eludes description, some call it "presence, class, or style", but this superior air distinguishes every movement of the Georgian Grande. They are extremely versatile and good at multiple disciplines, their movement is that of upper level dressage. They excel in driving as well as jumping, on trails they are dependable, quiet and calm. They grow big and stay sound. They possess strength, beauty and good mind! DISPOSITION: Intelligent, alert, proud but always calm and quiet. Easy to train and very willing to work. CONFORMATION: The ideal Georgian Grande is well proportioned and presents a beautiful overall picture. Once mature the ideal Georgian Grande should definitely appear to be "built up hill" carrying itself with deep hocks, well up under the middle of the horse in movement. The Georgian Grande should be in good flesh, with good muscle tone, smooth glossy coat. Feathering on legs is quite acceptable, but not required and may be shown with feathering or clipped. Stallions should exhibit masculine look while femininity in mares is desired. Heights for horses can range from 14.2 hands to 17 hands and above, with the average being 16 hands. Weights from 1000 lb. to 1400 lb. HEAD: Well shaped head with broad flat forehead. Eyes should be large, luminous, expressive and set wide apart. Eyes can be any color, blue eyes shall not be penalized. Faceline should be straight or slightly concave. Muzzle relatively fine but must have large nostrils, clean, smooth, strong jawline. The ears should be expressive, well shaped, attractively set and carried alertly. NECK: The neck is one of the most important points of conformation in the Georgian Grande horse. It should be long, well muscled denoting strength, suppleness and power, should be well arched, and well flexed at poll with good clean throatlatch. SHOULDER: Deep, sloping, well laid back allowing for great freedom of movement. BACK: Strong, level and relatively short. Supple in movement with well sprung ribs. CROUP: Long, not table top level but rather slightly sloping. The hips big, round, and powerful. The hindquarters should be strong and well muscled. Chest proportionate to the horse. The muscles of the forearms, croup and gaskins are especially emphasized. LEGS: Front legs set well forward under the shoulder, rear legs clean and correct, not cowhocked nor sickle hocked. Proper angulation to the rear legs to allow for a good jumper. KNEES: Large, flat and clean. HOCKS: Large, clean, flat in front and at the sides, wide from front to back. Hocks should be positioned so that a line dropped from the horse's buttocks falls straight down the back of the hock and cannon. Legs should be straight with plenty of good, clean flat bone. When mature there should be at least 9 inches (or more) of good hard flinty bone just below the knee (circumference). The more bone the better! It should be noted that Georgian Grande horses are not fully mature until five to six years of age. CANNONS: Well made, when viewed from side should be flat and broad, tendons behind cannon firm and smooth. Pasterns are sloping, tendons well defined. FEET: Hooves should be of proper size to carry the weight of this big beautiful animal. Well built, round, open at the heel, sound. May be shown shod or unshod. 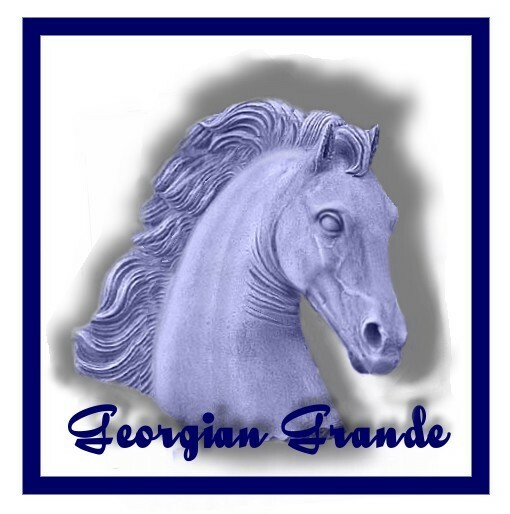 The mane and tail are naturally full and flowing; however, for show purposes, a Georgian Grande may be exhibited with mane braided or unbraided. Georgian Grandes may be shown with feathers, or without, at the owner's discretion. The mane may also be pulled as for hunter/jumper. (optional) Tail always natural, never docked (as the draft) and never cut (as the Saddlebred). MOVEMENT: TROT: The ideal Georgian Grande horse should move with a lot of suspension (lift) and power from behind (impulsion). Great flexibility in the loins and freedom in the shoulder. Above all, the horse must be able to get his hocks well up under himself from behind, ("deep hocks"). The horse must be able to deeply bend the hock and stifle, and set the hind foot well under the center of his weight. By bending the hind limb this way he lowers the entire hindquarters and thus appears to "lift up" the front end. The trot should be very light on the forehand, carrying most of the weight on the rear quarters. . The trot must exhibit good impulsion, suspension and extension. The hind foot will actually contact the ground slightly before the front foot on the opposite side (called Diagonal Advanced Positioning or "DAP"). The front feet should not wing nor paddle, but move straight ahead. The canter is balanced and round with hocks well up under the horse. The walk should be supple and very energetic with good overtrack. "Marching forward with good swing to the hips showing suppleness through the back." OVERALL IMPRESSION: One of grandeur, and great power, yet very gentle and submissive to rider or handler. A large, very impressive horse that commands attention wherever it is seen. THE BEST OF THE SADDLEBRED AND OF THE FRIESIAN OR DRAFT. THIS IS THE GEORGIAN GRANDE, "THE PERFECT BLEND!" Scoring is based on 50% movement, 50% conformation, manners and overall impression. Disqualifications: Serious conformation defect such as overbite, underbite, only one testicle descended (stallions) or any unsoundness, lame, etc. Short, heavy neck, Man made scars and blemishes shall not count against a horse. Excessive unruly behavior such as biting, kicking, rearing, striking, results in disqualification of a Georgian Grande in the show ring.